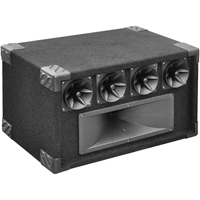 This SoundLAB 400W 5 stage tweeter speaker system is an ideal solution to the problem of muddy, flat, and soft sounding PA systems by producing up to 400 watts of quality rich treble sounds. It's a great treble booster to compliment many PA systems. It features four 3.5-Inch horn piezo tweeters, plus a 4-Inch x 14-Inch super horn midrange/tweeter.